This loud and raucous member of Cracid family can only be found on Pacific Slope of Western Mexico from Jalisco to Chiapas. It is a relative of guans and curassows rather than of a turkey, for which it is commonly mistaken. Although not very colorful, this species cannot be overlooked when vocalizing. Its gruff, throaty, rhythmic chattering, usually performed by several animals at the same time can be heard from a long distance and is an easy giveaway of the birds’ location. Tied principally to the tropical forest surrounding the Bay of Banderas, it can also be occasionally spotted in green suburban areas. Chachalacas usually travel in groups of up to 10 individuals. Rarely seen on ground they prefer to move in the forest canopy, where they feed on vegetable matter, especially fruit. Nesting is not something Chachalacas are too fussy about. Their nests resemble flimsy platforms made of leaves and twigs, placed in a tree or a bush. Usually 2-3 eggs are laid. In the Bay area, this species can be found almost throughout. 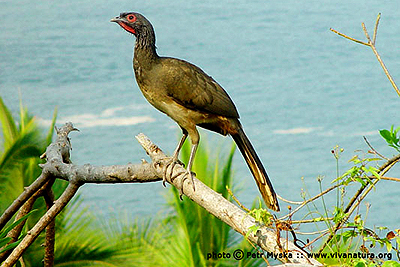 Populations of this endemic bird have been suffering from habitat destruction in the area as well as from poaching.